The Natural History Museum of Utah’s Collections and Research Department is grateful when an individual or organization considers donating their specimens or artifacts to our institution. Careful consideration goes into the decision of whether an object is best placed here or if it would be better suited at another institution. 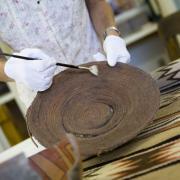 Objects or specimens should fit within the research scope and mission statement of the museum. At a minimum, specimens and artifacts must be legally acquired and have appropriate documentation, which may include copies of permits when required for legal collection. Collection staff will not accept objects left at the Museum unless prior arrangements have been made. Note: At this time, we are not accepting donations of marine shells. Research specimens are rarely displayed but they are given the highest standard of care. Using professional best practices, collections staff prioritize preservation of these objects in perpetuity for future scientists, researchers, students, and public knowledge. Specimens or artifacts not suitable for research may be useful for education and outreach. These specimens are critical to the museum's mission of bringing science to the public, but they receive a lower level of care than research specimens. We take the responsibility of accepting any object very seriously. It takes many hours of technical labor and significant resources to properly care for new objects. Objects are stored in rooms with strict environmental controls, and 24/7 onsite security. Specimens are in state-of-the-art archival containers to insure their long-term preservation, and all relevant data is entered and integrated in a modern collection management database. Because of the expense associated with curating collections, donors may additionally choose to make a monetary gift to offset that cost. The Natural History Museum of Utah abides by all local, state and federal laws in the collecting and holding of objects in our collections. We cannot accept specimens or artifacts unless they have been legally and ethically collected. Unsolicited specimens and artifacts shipped to the museum, will be treated as abandoned property and disposed of. Please follow the proper procedure, to ensure the best care for the material. The Museum is regularly contacted by people wishing to donate salvaged dead animals as potential specimens. We can consider most species of mammals that are salvaged (if they are relatively undamaged and have accurate information on where and when they were found). However, the possession of all native birds and any species listed as threatened or endangered is closely regulated by state and federal laws. Currently, the museum does not hold salvage permits for birds, reptiles, amphibians, or any species listed as threatened or sensitive, and we cannot accept them as donations. Collections staff may be willing to identify objects if time and expertise allow. However, museums are legally and ethically prohibited from providing monetary estimates of the values of objects or specimens. A donor seeking an appraisal needs to seek the services of an accredited appraiser. If you have questions about donating an object, please contact registration. If you have a fossil that needs identifying, please submit an online fossil identification request. If you have a question about a specimen or an artifact, please contact the manager of that collection. Click here to make a monetary donation to the Natural History Museum of Utah.